East Manufacturing, manufacturer of aluminum flatbed, drop deck, dump and refuse trailers as well as aluminum truck bodies and steel dump trailers, continues to equip its trailers with components that reduce weight in addition to guarding against corrosion to increase life and residual value. To that end, East has introduced its aluminum air tank as standard on all trailer types and models. Efforts are constantly being made to reduce tare weight of East trailers. Emerging technology by suppliers and developments in new alloys and extrusion design continue to drive the effort forward to find ways to reduce the weight and maintain the efficiency of the equipment. East stresses the strength-to-weight ratio to provide maximum return to the investment dollar. Joining its Alcoa Ultra ONE aluminum 22.5 x 8.25 wheel as standard, the East aluminum air tank is standard on all new East trailers. Made with less corrosive and lighter material than the steel air tank, the aluminum air tank weighs 13.8 pounds, 10.7 pounds less than the steel. 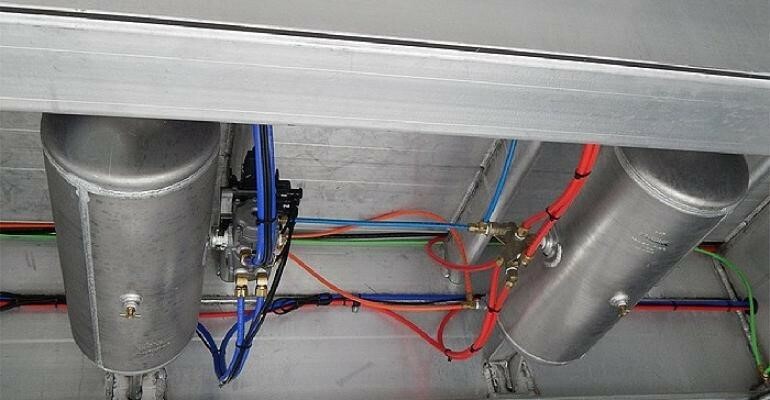 The trailer air tanks provide air pressure volume to operate the pneumatic system, including brake actuation and suspension performance (including lift axles, steer axles), tire inflation, tailgate operation and more. Each East trailer has a minimum of two tanks so a tandem-axle trailer has 21.4 pounds less weight. The more axles added to a trailer, the more tanks required. Multi-axle trailers with a variety of lifts and/or steer axles could translate up to 150 pounds in weight reduction. In addition to its lightweight, the aluminum reduces corrosion.